Guest Artist Dominick Serna (@domdomhair) teaching an Advanced Academy cutting class at the International Institute of Cosmetology on 11-5-17. Seven years ago, MODERN SALON Media collaborated with the American Association of Cosmetology Schools (AACS) to develop MODERN SALON’s Excellence in Education program. The purpose is to help the professional beauty school community gather, share and celebrate examples of great salon education experiences and beauty career development happening across the country. As any great stylist knows, learning never ends. And new graduates of top schools across the country need look no further than their alma maters. Schools are offering advanced education, guest educators, social media connections and much more. Often these extras are free of charge or heavily discounted for alumni, so new stylists can afford to continue their education and take their skills to the next level. There’s no shortage of classes available to alumni after graduation. Some schools have advanced academies designated to offer continuing education while others offer a series of post-graduate programs, classes or workshops to expand knowledge and help new stylists grow their income through specialized services. At the International Institute of Cosmetology in Plainville, Connecticut, the need for additional education was recognized and addressed this year in a big way. Schools all over the country are following suit, bringing in guest educators to offer advanced education in barbering, make-up, microblading, laser training, advanced color skills, eyelash extensions, bridal make-up and much more. Alumni newsletters, Facebook pages and websites keep new stylists in touch with their schools and updated on available classes and speakers. Arrojo Cosmetology School's clinic with mezzanine stage. In addition to discounted classes and guest educators, some schools provide sites and apps just for their alumni. 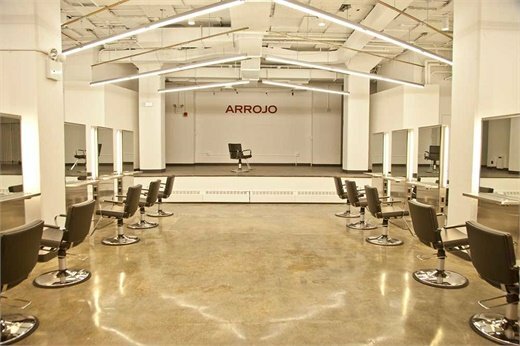 At Arrojo Cosmetology School in New York, graduates are added to an alumni database, where they receive a tailor-made marketing e-mail for Arrojo education as well as other opportunities like New York Fashion Week. To stay connected on social media, they use the hashtag #arrojoalumni. “An Arrojo, alumni will always be part of our family,” Owner Nick Arrojo says. “We maintain an alumni e-mail database and have social media hashtags dedicated to our graduates so we can always keep in contact, see and celebrate their work. At MC College Group in Edmonton, Alberta, students and alumni are offered the opportunity to travel abroad where they are exposed to international education, culture and networking. “We wanted to offer our graduates and students the opportunity to learn, network and travel aboard at the same time,” Chinda Sin, marketing coordinator at MC College, says. “This past September, we went to the beauty and fashion capital of the world: Paris. From touring the Eiffel tower and the Dior exhibit at Musee des Arts Decoratifs to meeting the best of the best the beauty industry has to offer at the MCB by Beauté Sélection beauty exhibit, the trip was a great way for graduates and students to draw inspiration, and a reminder of why they started in the beauty industry. Schools are proud of their successful alumni, and in addition to offering them special trips and advanced education opportunities, they often highlight them in blogs or on social media as inspirations to current students. Alumni work is also featured online and hanging on the walls of schools.